Property Dispute Court Case This Friday-Here’s the Details. It’s an old story but it’s a good one. For another court case springs up and the question is, will they destroy my fence and take away my property? Let me say, right here as I tap the keyboard, that I have no idea what I am doing. 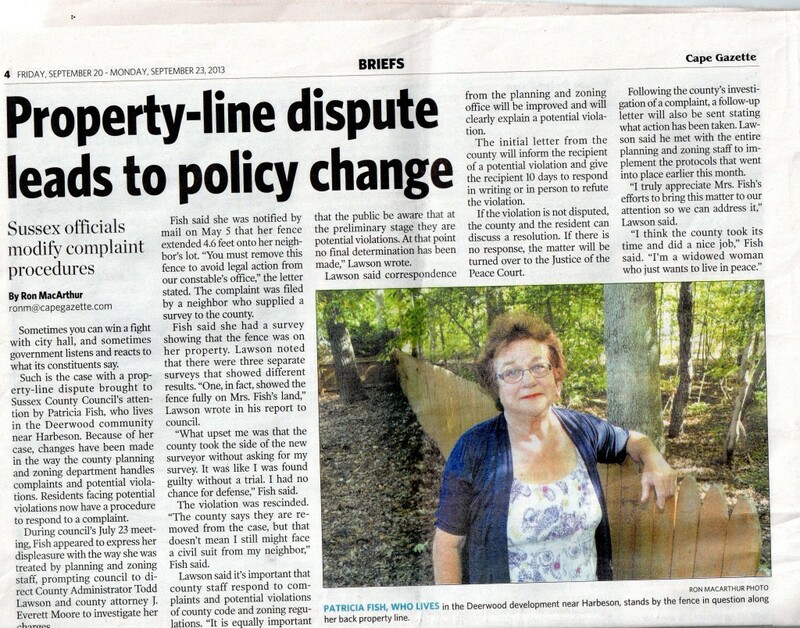 I begin by inserting the story from the Cape Gazette, the story of my property dispute with the fine, fine folk behind me, who moved in, didn’t even say Hi, and slapped me a notice to tear down my fence. I moved to Deerwood community in 2003. My husband was alive at the time and for ten years we lived great. I loved the land and took care of it with all the love within me. In fact I am a certified Backyard Wildlife Habitat Specialist, certified by the National Wildlife Federation, and work with the Delaware Nature Society to help folks like yon readers set up their own backyard worlds into habitats suitable for BOTH humans and the critters that fly. I never bagged a single leaf, but compost my own for glorious garden dirt that will grow anything. I have several gorgeous gardens in my front and love my green thumb. I had a proper Sussex county legal survey BEFORE I moved in….five copies in fact, all embossed to insure they were filed with the county. In the month of my husband’s death, I will never forget it, April 2013, a whole bunch of surveyors showed up at the fence behind me. On the very DAY of my husband’s funeral they refused to leave and notified me that my fence was on their land, tear it down or they will sic the county on me. I said Good Morning to them too. So the county was sicced on me, but by reading the story above, note that the county DROPPED the case, not only dropped but apologized to me because guess why? NOBODY ASKED ME IF I HAD A LEGAL SURVEY. Nope, my letter from head of the Zoning board, Dean Pettyjohn, told me to shut up and tear down my fence. In some parts of America that’s called being tried and found guilty WITHOUT any kind of trial. As yon reader can see, the county changed its procedures, dropped my case, and bid me well. 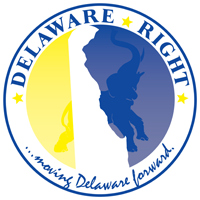 But the fine folk are taking me to Sussex county Superior court this Friday-11/6/15-at 11 am. The are demanding $1900 to tear down my fence that , they assert, is on their property. Their testimony, as sent to me, asserts that I built my fence in April 2013—-say what? Oh yeah! I built it on the day of my husband’s funeral. I honestly don’t know who built that fence because it was there when I bought the house. I do know I have dogs and my wellhead is only about four feet from the fence line that the fine folk behind me want me to tear down. Never do they mention my own survey, which I sent to every one of them, the builder, each homeowner protesting (do to a misfortune of logistics, my fence appears to be on THREE people’s property but the other two, having some class and decency, accepted the county’s determination that my survey was legal, that the fence was not on anyone else’s land). They are terrifying me and why? Well here’s the irony. My house is not mine after I die. I have a reverse mortgage on the place and when I die I have not an heir one who will get a drop of dirt of this land. I bought my daughter a house with my reverse mortgage so, again, there are no heirs. Thus I could care less about this four feet of land but guess what offer the fine, fine folk offered me? They sent me a letter, on legal letterhead to better intimidate, and told me they would let me keep my fence if, GET THIS, I would pay some $300 fee to record this fact with the county. Yon reader, imagine yourself living on a lot for over ten years when a couple moves in behind you, demands that the county tear down your fence then informs you that they won’t destroy your life if only you pay this little bit of money. Seriously, I would have agreed that after my death all of those people could have those four feet of land. It matters not a whit to me. But that so-called “offer” was an insult and nothing less. So I don’t know what’s going to happen in court this coming Friday….I will update this post after the court case I suppose. I only ask that you wish me luck. I only want nothing less than fairness and there’s nothing fair about this. NEXT : Got a national tidbits brewing other big events coming up. 2 Comments on "Property Dispute Court Case This Friday-Here’s the Details." It’s kind of interesting how the section of fence she’s leaning on isn’t as weathered as the section of fence visible back by the tree. That untreated wood looks to have held up pretty good for 12 years. Not much weathering at all. This has finally become clear. Having a survey showing a fence on your property is not at all the same thing as having a survey showing THAT fence on your property. That remarkable unpainted, unweathered fence that’s been there for more than 12 years as of the date of that photo. When you got your incessantly barking dog, were you at all concerned that the bottom of the fence might be rotted enough for the dog to get out under it? I suppose not, since the bottom of the fence shows no signs of previous years’ leaf accumulations. The dang thing must clean itself.